Our family got started on reading through Thornton Burgess's Green Meadow series quite by accident. Years ago I had read Old Mother West Wind (linked to review) and wasn't quite sure what to make it of. My lasting reflection was that it was a cheesy story that felt like a "knock off" from other people's tales. (You'll see what I mean if you click that link to my review from back in the day.) Really, I hadn't thought about Thornton Burgess in years. Then, a few months back, Jonathan and I were out on a date night and found ourselves in a bookstore (*cough*cough*). I picked up one of Burgess's Green Meadow stories and flipped through it, thinking it might be an easy independent read for Bookworm2 (age 7) and so brought it home. In the end, instead of him reading the story alone, we read it aloud together. It was a hit! Thornton Burgess was a great lover of nature and his children's stories are based on animals, whose habits and tendencies Burgess seemed to know quite well. Born in 1874, Burgess spent his formative years on farm land in Massachusettes. He tended cows, picked berries, trapped muskrats and observed the natural world. He spent 50 years of his life writing children's books and as the backdrop for these stories he drew a lot from the landscape which he was so a part of as a young person. All told, he wrote over 170 stories, popularly referred to as "bedtime stories" which have been enjoyed by children the world over. Burgess is about the business of telling a moral tale through the use of his animal friends. His characters who are suspicious of others soon learn the importance of trust and kindness. The characters that are show offs and braggarts meet humility in less than kind circumstances. Perhaps the preachiness would bother some but I find the stories so quaint and well-told that the warnings against pride and selfishness are very well-received. The character of Reddy Fox, for example, has given us things to discuss when we're talking over our own behaviors between our own family members. These books are not only fun, but useful! I'm solidly sold on Burgess as an author of children's stories at this point in time. Not only have I been collecting the titles for us to read, but these are going to be go-to gifts for early readers. It's a beautiful world that Thornton Burgess lived in and created. There is a peacefulness about these books which is hard to find in books these days. If you are looking for an easy early chapter book and like the classic feel - look into these books. I don't think you'll be sorry! For my part, I'm glad I didn't work off of remembrances and impressions from years ago, passing the Burgess title by instead of bringing it home with me. Our reading life has been so enjoyable these days, thanks in large part to Burgess. Neat - it's always nice to be pleasantly surprised by an author you thought you knew. 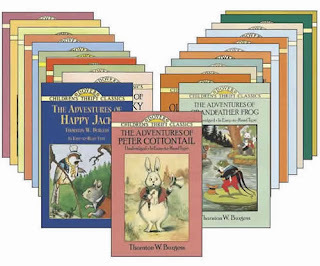 Daniel's family has found memories of a hardback collection of Thornton Burgess animal stories - but, as with many children's books, I missed these growing up. I look forward to reading them as our kids get a little older. We read his animal stories consistently this last year of school as part of our morning reading time (and still aren't done with it), but it was one of our favorites! Oh my goodness! Reddy Fox was one of my very favorite books when I was little (fine, I STILL love it), and I had no idea there were any others in a similar vein. Now I have to fine these.